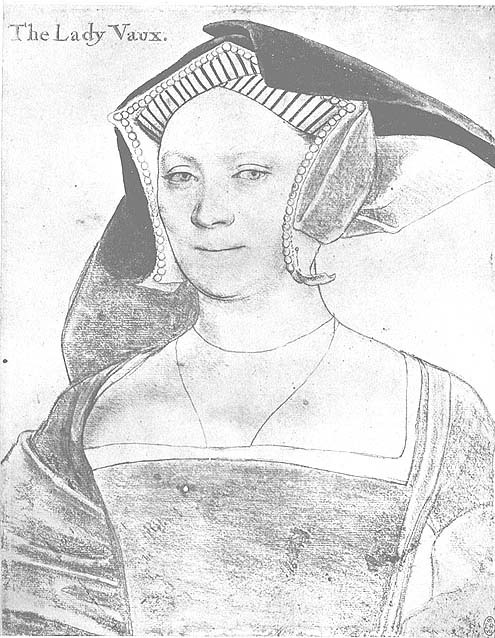 Most women of the early sixteenth century Tudor court wore the gable headdress in its many forms, and later wore the French Hood. However there are several images of women in other forms of head wear. These drawings show hats similar to those worn by men of the period, except they are worn over a fitted and wired or stiffened linen undercap. In addition to the feathered hat made famous by portraits of Henry VIII, men also wore several variations of hat, or 'bonnet' as they were called by those who wore them. 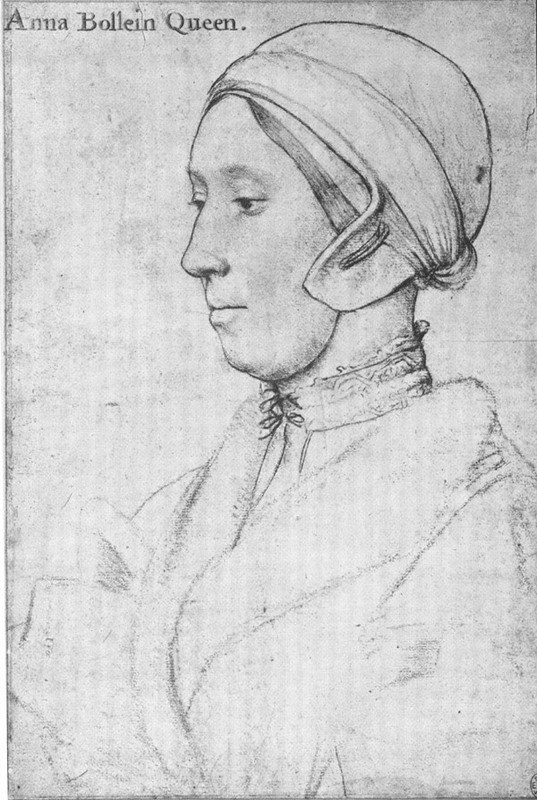 I've included a sampling of these from drawings by Hans Holbein. 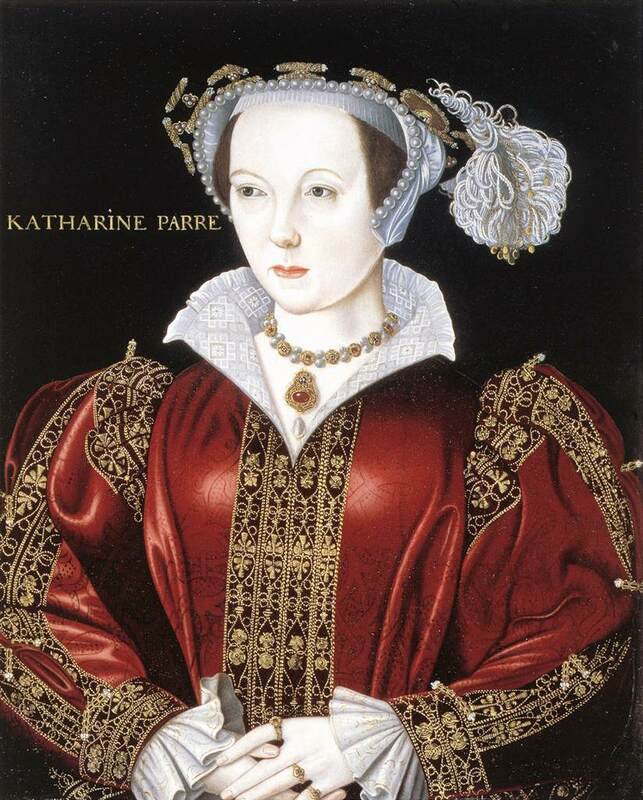 For images that depict women's gowns from this period see Tudor Dress: A Portfolio of Images. For images that depict women wearing the gable headdress, see Tudor Gable Headdress: A Portfolio of Images. 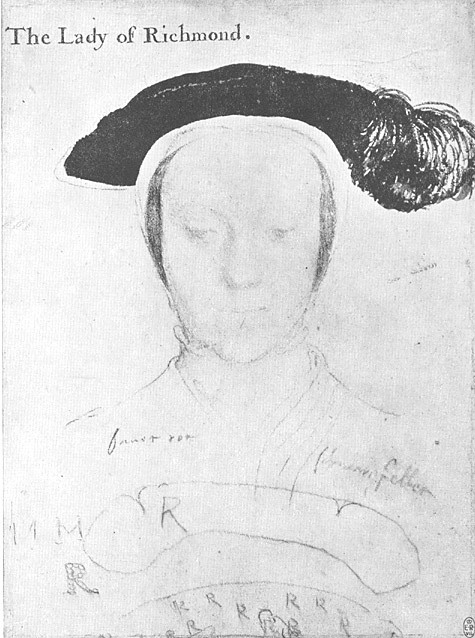 This drawing is probably a preliminary sketch for the painting of Thomas More's family done during Holbein's first visit to England, 1526-28. 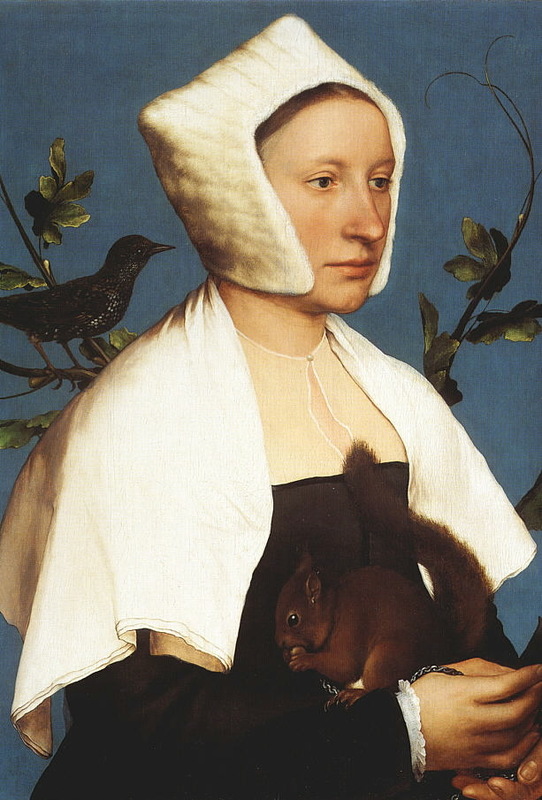 Similar to the hat worn by the woman in the portrait "Lady with a Squirrel." 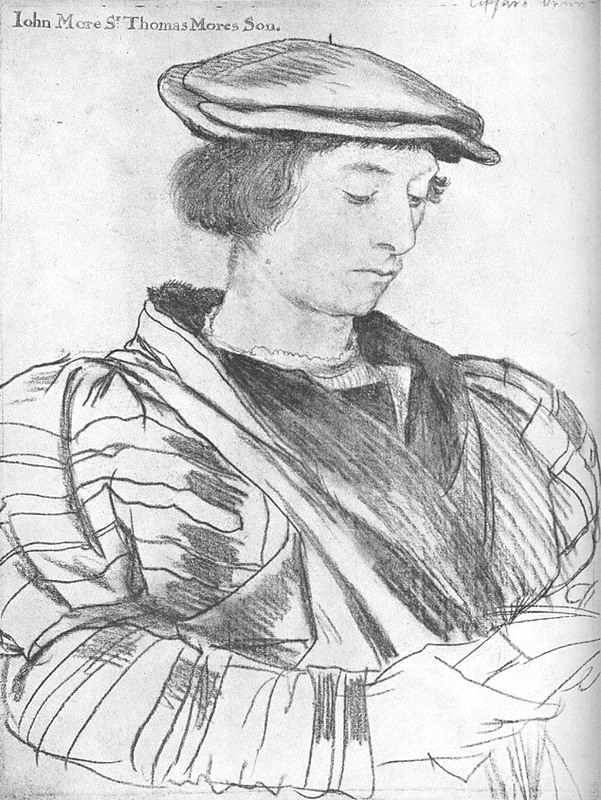 Probably drawn during Holbein's first visit, 1526-28. 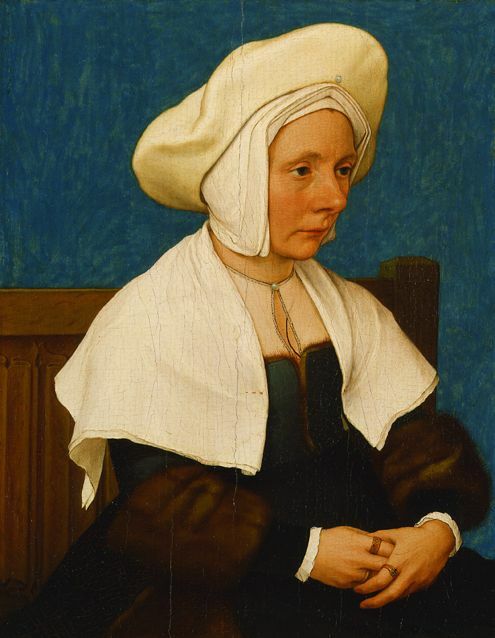 Similar to the hat worn by the later portrait of an unknown woman. 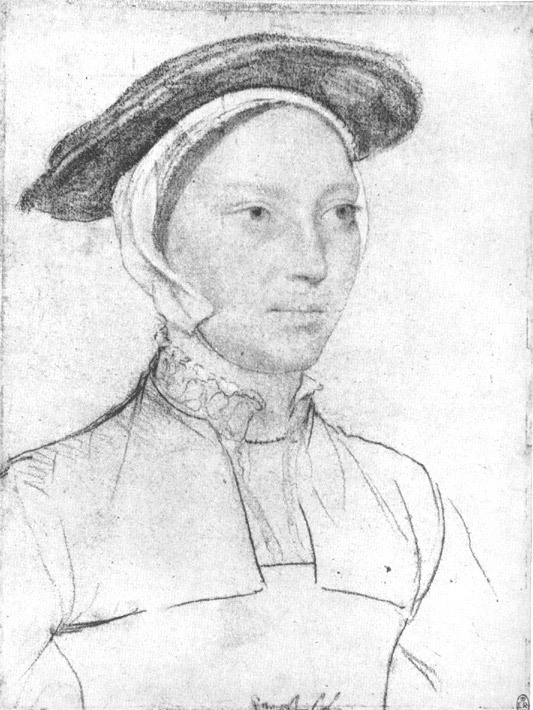 "Mary Howard, daughter of Thomas, third Duke of Norfolk and sister of Henry Howard, Earl of Surrey, born 1519; married Henry Fitzroy, Duke of Richmond, natural son of Henry VIII by Elizabeth Blount, in or after 1533; died 1557." 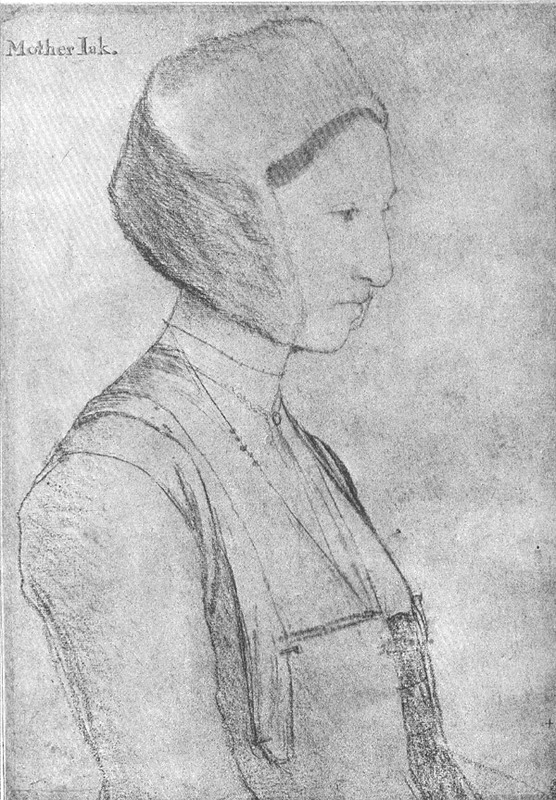 The drawing may have been done at or about the time of their marriage in 1533. 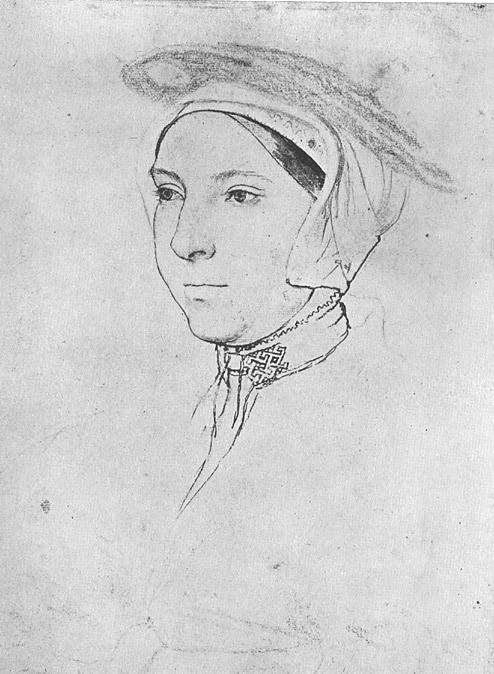 This and the following drawings were probably done during Holbein's second stay in England, 1532 until his untimely death there by plague in 1543. The hat appears to have a brim. The undercap appears to have a tie under the chin. The hat appears to have a brim. The undercap appears to have a tie under the chin. 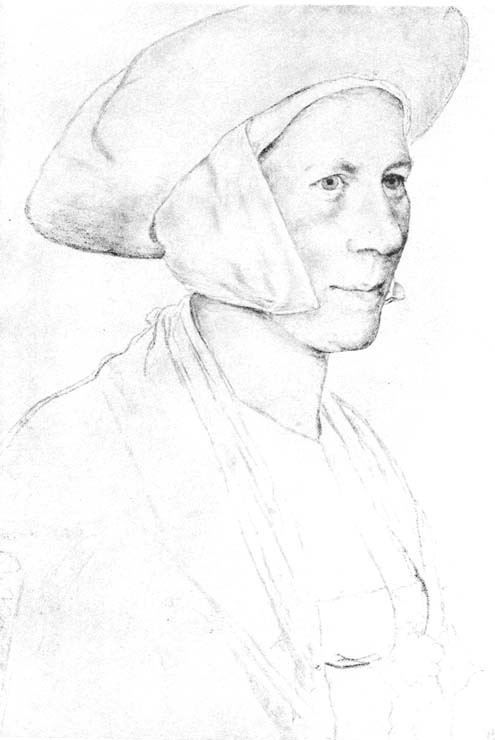 Note the similarity to the cap worn by the picture labeled "Anna Bollein, Queen" below. This is a sampling of the bonnets worn by men. They include several distinct construction styles. None of these, and none of the other images in the Windsor collection of drawings by Holbein, show a horizontal seam in the crown. Preliminary drawing for More family portrait. 1526-28. 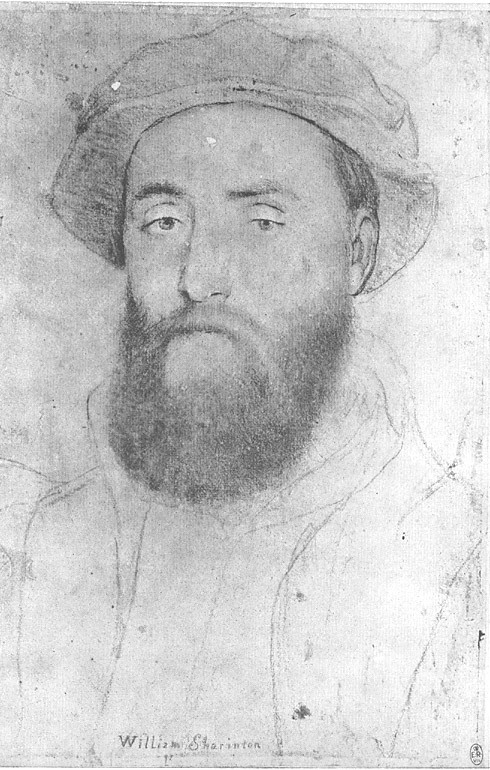 John More's bonnet appears to be of felted wool with the crown shaped like a beret and a split or two piece brim. 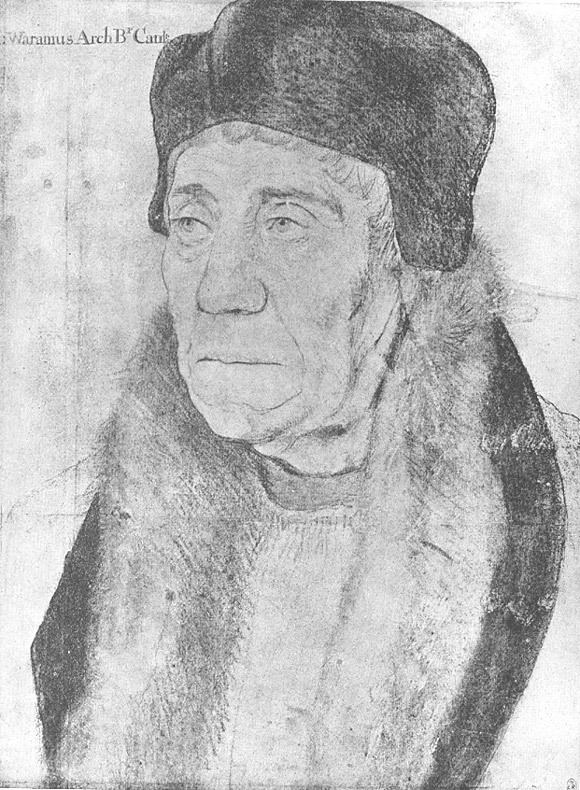 The Archbishop wears the felted, shaped hat with ear flaps and a peaked front. Sir Thomas wears a variation of the ear-flap bonnet, this time with the flaps folded up and tied across the top. 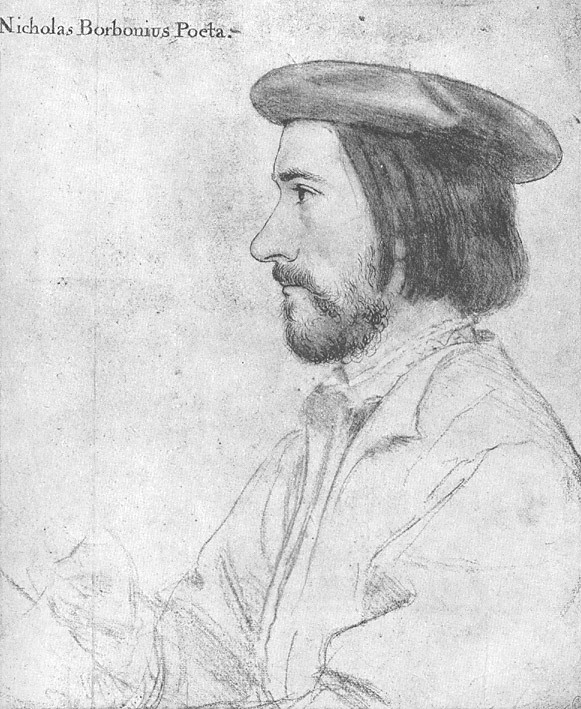 This and following images were probably drawn during Holbein's second stay in England, 1532-1543. 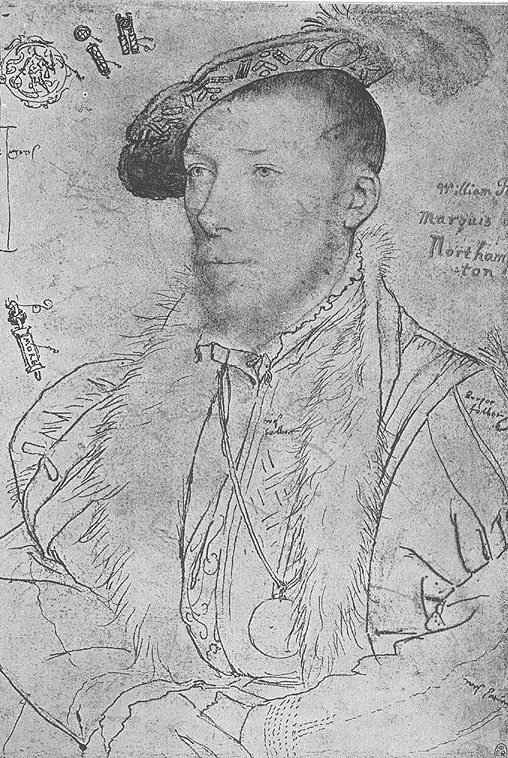 "...second Baron Vaux of Harrowden, poet, born 1510; succeeded to the title 1523; traveled to France in 1527 and 1532, with Wolsey and Henry VIII respectively; Captain of the Isle of Jersey till 1536; died 1556." (Parker, p. 42) Husband of Elizabeth, Lady Vaux. The crown of Lord Vaux's bonnet is almost as large as the brim. Shaped bonnet with no brim. "...brother of Queen Catherine Parr, born 1513; knighted about 1538; created Baron Parr, 1538/39; Knight of the Garter, 1543; created Earl of Essex, 1543; created Marquess of Northampton, 1546/7; ...died 1571." 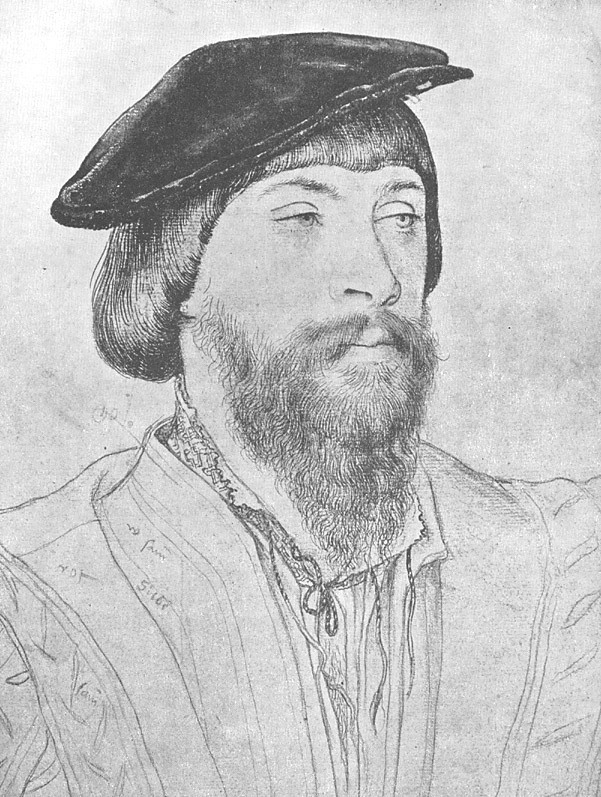 The Marquess wears the most familiar, though not necessarily the most popular, Tudor bonnet, with a jeweled brim and feather. The Earl's bonnet may pose the answer to the design questions surrounding the familiar jeweled bonnet. Many of these appear to have a split in the brim. Could they be constructed like this one, with both portions of the brim turned up? Sir William's bonnet is notable for it's large soft crown and smaller brim. 2. Dvorák, Frantisek. 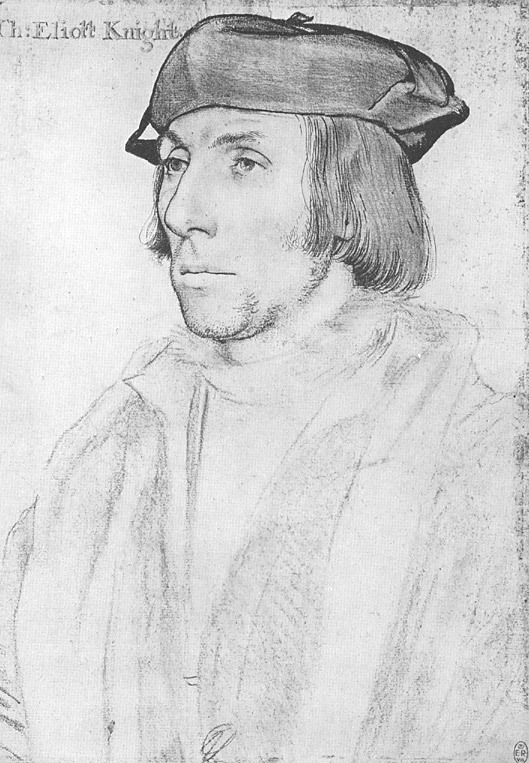 Hans Holbein le jeune. Paris : Éditions Cercle d'Art, 1977. 3. Ives, E.W. 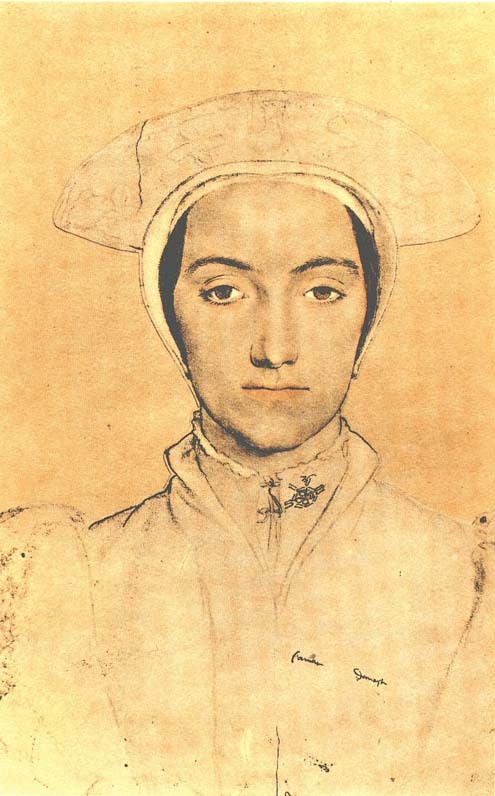 "The Queen and the Painters: Anne Boleyn, Holbein and Tudor Royal Portraits." Apollo 140, no. 389, 1994. 4. Parker, Karl Theodore. 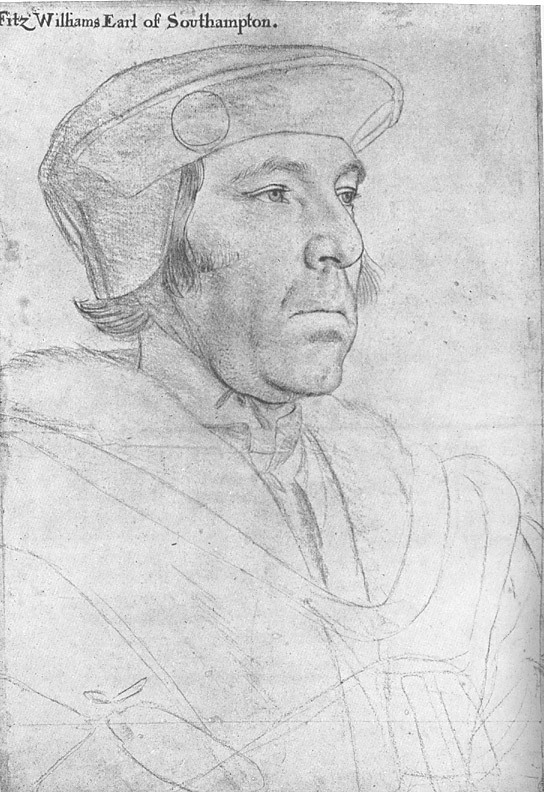 The drawings of Hans Holbein in the collection of His Majesty the King at Windsor Castle. Oxford & London, Phaidon Press, 1945.